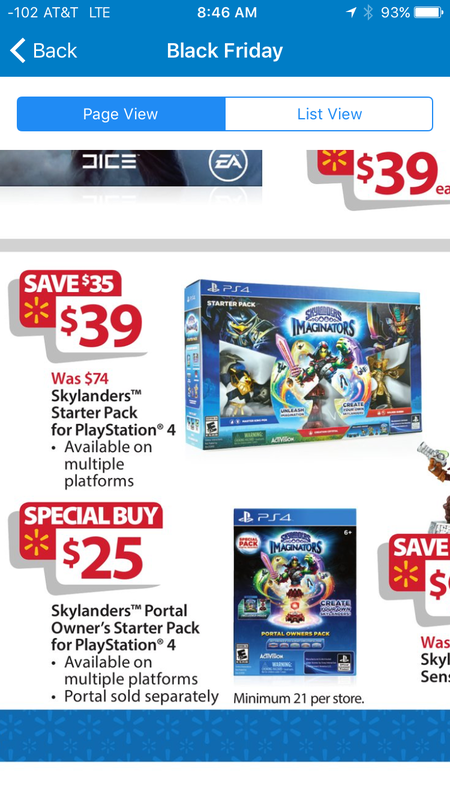 I saw in Walmart's Black Friday ad that they listed a Portal Owner's Pack for Imaginators. I haven't been able to find any information on it. Sorry if this has already been answered, but is there a list of what comes in the pack anywhere? It says it's a "Special Buy" so maybe it's just some special deal that Walmart is getting for Black Friday. I'd like to know more about it, as my son has been saving up his money to buy it himself. He has enough for the portal owner's pack ($25), but if it was like Giants, it probably doesn't come with as much as the starter pack (i.e. less figures), so it might be worth paying the extra, anyway. Edit: I was able to find a copy of the ad where I could zoom in a bit and it looks like it may only come with a creation crystal, so no senseis. Definitely doesn't seem worth buying, to me, unless you're just buying it for another system (i.e. PS3 and getting the PS4 version). Oh wow, this is pretty silly. Not even a Villain? At least 25 bucks is a great deal, but after launch, few will care. I wonder how much the portal owner's pack would have sold for 'normally', if it had been available at launch? $25 for just the game and a crystal would normally be a great deal, but not when the full starter pack is selling for only $14 more. I was wondering if they were going to do another Portal Owner's Pack this year, as I really don't want another portal, but it should be substantially lesser than the normal one for me to consider it. The normal starter pack actually looks like a much better deal this time, considering you get two Senseis for just $14 more (the regular price of one Sensei). I'll have to think about this. Starter Pack on Black Friday sales is just 10-15 dollars above Portal Owners looking at the upcoming sales, so -for now-. it's still the better option. If you just want Crash or miss the sales, though, it'll probably work nicely. Why didn't they come with this at the release? My guess (take it with a grain of salt) is that management was getting nervous that they were missing out if the "legacy" players really were done buying figures so came up with this. Fact of the matter is, saying one thing and doing another has been a trend for a while, and it's not helping. i think you are right about this, and later on they definitive should make imaginators a part of the ps+ and xbgoldlive digital library. just to get people to buy the figures and crystals to avoid retails to be stuck with a lot of figures all over again.